Clean water to drink and clean air to breathe; healthy wetlands, lakes and rivers that are safe for swimming and fishing; preserved open spaces; clean sources of energy that don’t pollute and never run out—all this should be the heritage we leave to future generations. Our staff research the issues, educate the public, and win tangible results. The problem with factory farms. Environment Maryland Research & Policy Center released a 2011 report outlining the extent to which factory farms pollute the Chesapeake Bay. The report found broad consensus among scientists and policymakers that current rules for managing animal waste need serious reforms. 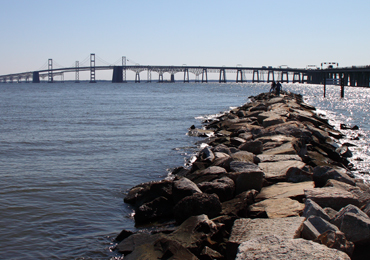 A new plan to clean the Chesapeake Bay. For years, we've pushed Maryland's leaders to get serious about restoring the Chesapeake Bay and curbing pollution from big developers and factory farms. In 2010, Gov. Martin O'Malley released a plan of action that puts stricter limits on these sources of pollution and takes other critical steps to clean up the Bay. Environment Maryland Research & Policy Center would like to thank MAGA Fund of the Jewish Community Federation of Baltimore and the Campbell Foundation for supporting our work in Fiscal Year 2017. Environment Maryland Research & Policy Center gratefully accepts bequests, beneficiary designations of IRAs and life insurance, and gifts of securities to support our work. Your gift will assure that we can continue to protect Maryland's air, water and open spaces for future generations.